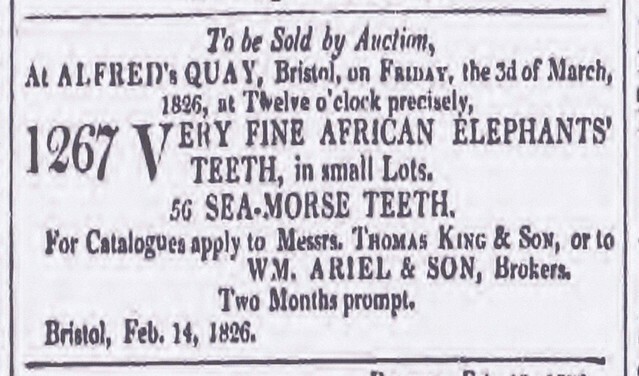 Two advertisements from the Bristol Mercury one 1824 and the other 1826. A small boat returns from Africa and on the small wharf, where the caves are located, there is an auction. The main item auctioned were Elephant Teeth (tusks) and these auctions were as a result of over 1,000 dead elephants. Scrivello - an elephant's tusk of a small size commonly used for making billiard balls. Camwood (Baphia nitida), also known as African sandalwood, is a shrubby, hard-wooded African tree. Its wood is commonly used to make a red dye. The earliest dye wood (Camwood) was from West Africa. The source of the dye, which is soluble in alkali, is the bark and heart of the tree. Camwood is a red dye-wood imported from tropical West Africa, and obtained from the Baphia nifida, a leguminous tree, of the suborder Caesalpinieae. This wood is of a very fine colour, and is used in turnery for making knife handles and other similar articles. The dye obtained from it is brilliant, but not permanent. It is called sometimes Bar-wood, though this name belongs also to another tree. 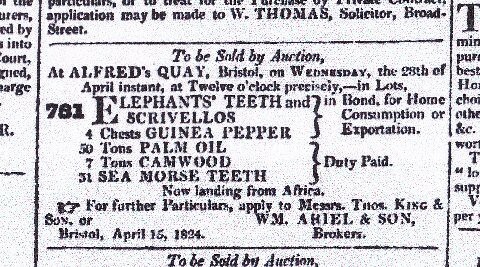 Sea Morse Teeth - a name for the canines or tusks of the hippopotamus, and which supply the most suitable ivory for the dentist to manufacture false teeth.